Two weeks ago, for example, as Deacon John and his wife, Tammie, were on their way to church, they saw a man digging through a dumpster, looking for food. They stopped to see if they could buy him some supper. Although they are called to serve, the couple saw this as yet another example of how people constantly reflect God back to them. “It was a privilege to witness that,” Tammie says. Deacon John and Tammie say the diaconate and the ministry they do together and individually—Tammie is the director of religious education at Our Lady of Peace Parish in Erie— has become the basis for their marital spirituality. They look to a concept espoused by the Sisters of St. Joseph—love of God and love of neighbor—as a driving force behind their vocations. On Aug. 4, Bishop Lawrence Persico offered Mass at Our Lady of Peace Parish, Erie, in celebration of the 50th anniversary of the restoration of the permanent diaconate in the Latin Rite. It was in August 1968 that Blessed Paul VI approved the request of the bishops of the United States to restore the diaconate in this country, both to complete the hierarchy of sacred orders and to enrich and strengthen the various diaconal ministries at work in the US. 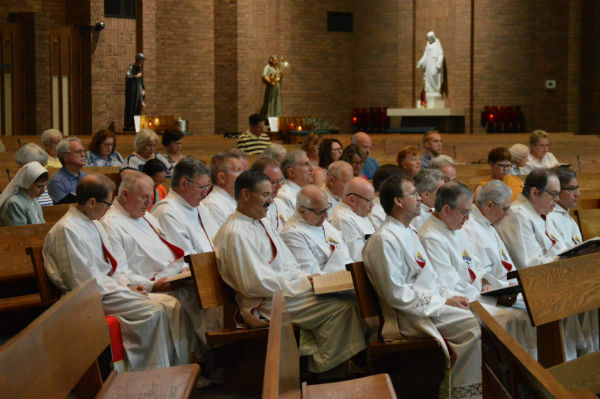 According to Father Mark Nowak, director of the Permanent Deacon Program for the Diocese of Erie, more than 65 men are currently serving in the active permanent diaconate in the 13 counties of northwest Pennsylvania. Another four men are in the fifth year of study while another seven are in their third year of preparation for ordination. In concluding his homily, Bishop Persico thanked the deacons for the service they have provided in the Diocese of Erie for 26 years.